Between painting people and landscape, Nick Miller brings elements of the natural world into his studio to try and hold them in paint in arrangements that resonate: a Still-Life in other words. Miller prefers the french term Nature Morte, which brings to mind the reality of the cycle of life, nature and death that underlies the genre. He returned to painting flowers in 2011 because he began using them in a collaborative creative project at North West Hospice. As is traditional in visiting the sick, he brings flowers, using them as a subject for watercolours in a temporary studio on the ward. 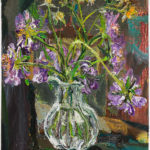 If appropriate, Miller engages with patients through the work, sometimes leading to portraits, interiors and sometimes just to flower paintings. By early 2013, this practice in the hospice had generated a new energy in his own studio for a new series of Nature Morte paintings. The process had become embedded, and the paintings became ways for Miller to make remote connection with his own mother, who was terminally ill over a long period: a way of attending her, even if not physically. They are titled by what is in them, but, the Vessels are equal subject: vases, bottles and pots she collected in her life.